2 - This post by Gluten-Free Girl and the Chef. I thought I'd share two recipe ideas for making this simple and often-hated green vegetable shine epicuriously. This is a dish best kept for those Wintry days when you need something warm and comforting. It languishes on the tastebuds and tempts you to have yet another bowlful. I have purposely left out exact quantities because soup is one of those magnificent things that you can add and take away from depending on what YOUR fave ingredient is and how many people you are cooking for, and it rarely ever flops. My only tips are: to save the boiling water from the broccoli to use for blending the soup together (unless you want to use a seperate stock); to add the blue cheese off the heat to the soup (at the blending stage); and to add the cream very last to the blended soup. I made this recipe up one day when my tastebuds were craving a zing-experience. It can be served hot or cold because either way - it's sublime! It just occurred to me that peppadews would be yummy chopped up into the vinagrette too, if you like them. So just toss the ingredients together and munch with all your might. 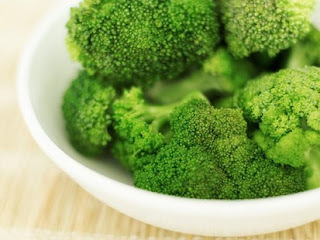 I hope these ideas inspire you to eat and enjoy these green little trees which pack a fantastic anti-cancer punch! I was just reading... broccoli is one of the "SUPER food"...should eat more of them for sure!